When you catch a ride with me, that’s what I try to drive home. During business hours the population of New York City expands to more than fifteen million people. 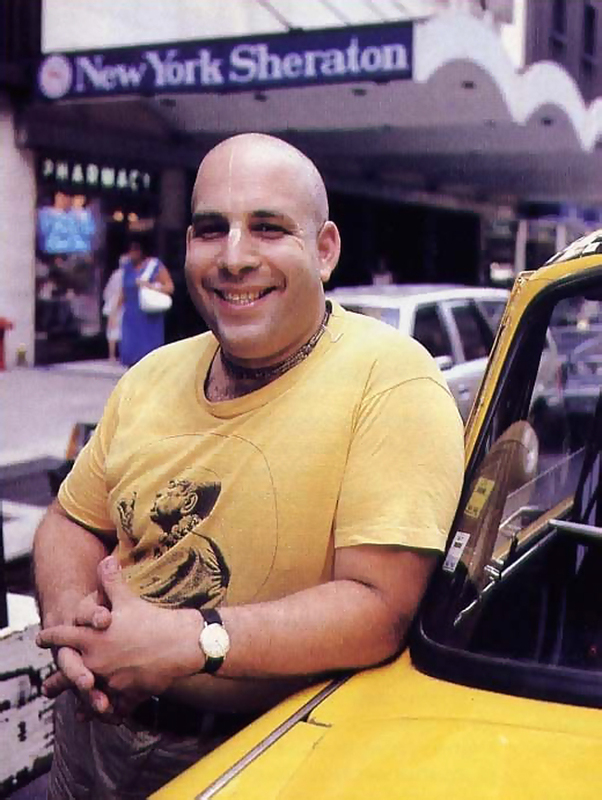 Many New Yorkers ride in yellow taxicabs for business, shopping, sightseeing, and the many other goings-on offered by the phantasmagoria called Manhattan. 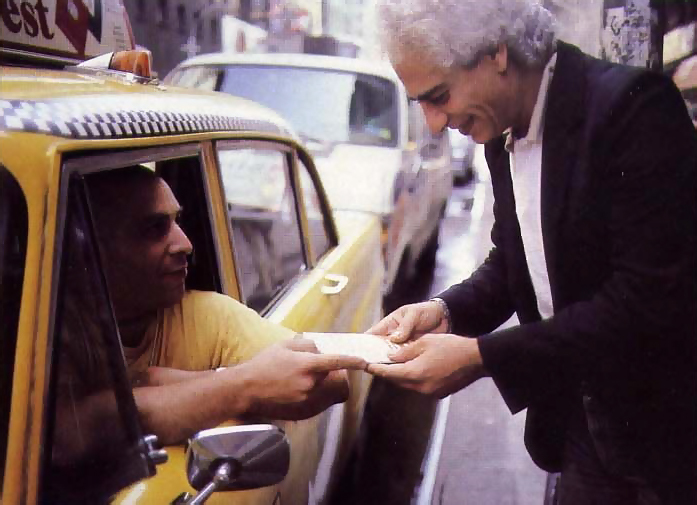 Occasionally some of these travelers get a different taxicab experience, when they hail the yellow Checker driven by a disciple of His Divine Grace A.C. Bhaktivedanta Swami Prabhupada. I am that disciple, and my name is Puru dasa Adhikari. 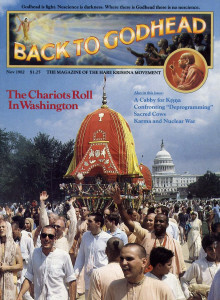 I joined the International Society for Krishna Consciousness in December of 1970. Because I am a member of the grhastha (householder) order, I must support my family as well as meet the spiritual responsibilities I have to my spiritual master and his mission. I’ve found that driving a cab in New York helps me fulfill both obligations. Everyone in New York City thinks he’s a philosopher. And who do they talk with about politics, religion, traffic, and the weather? Not their psychiatrists, business associates, or even their families as much as the New York cabbie. It’s his function to hear their ideas and respond appropriately. So every day as I drive through the streets of New York I have a marvelous Opportunity to speak with people—and it provides me a modest livelihood. As I cruise north on Madison Avenue in the four-degree weather of January, an older woman in a fur coat feebly hails my cab. She’s so cold and weak she can hardly raise her hand to stop me. When I stop she has trouble with the back door, so I get out in the cold to help her. But even after the door is open she can’t get up on the seat, so I tell her she can ride with me in front, since it’s easier to get in that way. Her name is Molly Rosen, and she’s a retired New York City schoolteacher. When she gets in, the first thing she sees is a book about Srila Prabhupada’s discussions with John Lennon called Search for Liberation. I keep a copy propped up on the dashboard so I can see my spiritual master’s photo and perhaps spark someone’s interest in Krsna consciousness. Puru: Oh, yes, it’s a fascinating book. Would you like a copy? I have extras. Molly: Why, thank you. I’m interested. I’m always looking for something that will help me. Perhaps some day I’ll find a cure. Puru: You have some disease? Molly: Very bad arthritis. Every bone in my body hurts. It’s almost like they were hollow. Puru: That’s too bad. Must be hard to deal with. My next-door neighbor’s got arthritis too. She complains about it, but what can she do? What can any of us do? You can’t stop the body from aging. Puru: But you know, let me give you an example for a simple philosophical point. If you tear your dress, you are not actually hurt—it’s only the garment you’re wearing. So if you can see your body that way—that it’s just a garment covering the eternal soul—then you think of it like the torn dress. You try to repair the damage if you can, but you don’t identify yourself with that hurting body, that torn dress. After all, you’re not that dress. You’re an eternal soul. And your arthritis is only temporary. Molly: It may be temporary, but I certainly am suffering. I don’t have any faith in anything spiritual anymore. Not after what I’ve seen. How could God let so many people be killed and tortured in Europe during the war? How can I believe in the soul and God when things like that are allowed to happen? Puru: Ma’am, don’t blame God because people ignore His instructions. After all, every day thousands of animals are slaughtered. The reaction for that kind of killing is that people are killed in wars. That’s called the law of karma. Every action brings a reaction, just like in Newtonian physics but applied more broadly. Molly: Well, I studied Hinduism, I know all about that, but it seems callous to me. How can you be so glib about so much suffering? Puru: If you have a spiritual outlook you aren’t insensitive to suffering—but you understand it for what it is. Suffering can help us to understand our spiritual nature. We’re all eternal servants of God. This material world is not our real home, so how can we ever really be happy here? All the scriptures teach this—that we should rise to a higher understanding of our identity. The Hebrew prophets, the Koran, Lord Jesus, and the Vedas, the scriptures from India—they all teach this point. Molly: It must be wonderful to have so much faith and be able to believe as strongly as you do. Puru: I wasn’t so sure of what I believed before I read Bhagavad-gita As It Is. That’s the book I’ve been studying. That’s where Lord Krsna explains all about the soul, and how we can understand that we’re eternal spiritual persons. His friend Arjuna was suffering and lamenting because his friends and relatives were going to be killed in a fratricidal war. You’ve lost friends and relatives, so you must know how he felt. Molly: I just went to a funeral last week. He was only 53 years old. Puru: You see what I mean? Anyway, Krsna explained to Arjuna that he had no reason to lament. Only the perishable body is slain but not the imperishable soul. The soul lives on after the death of the temporary body. Molly: I must admit it’s amazing to be speaking to a taxi driver about these kinds of things. “Hare Krsna, Hare Krsna, Krsna Krsna, Hare Hare/ Hare Rama, Hare Rama, Rama Rama, Hare Hare.” That’s called the maha-mantra, or the great chant for deliverance. If you try chanting it you can get free from your arthritis pain. Chanting will free you from misidentifying with the body, and you won’t take your bodily pains so seriously. Just like the torn dress. Molly: I’ll certainly think about it. Well, here’s where I get off. 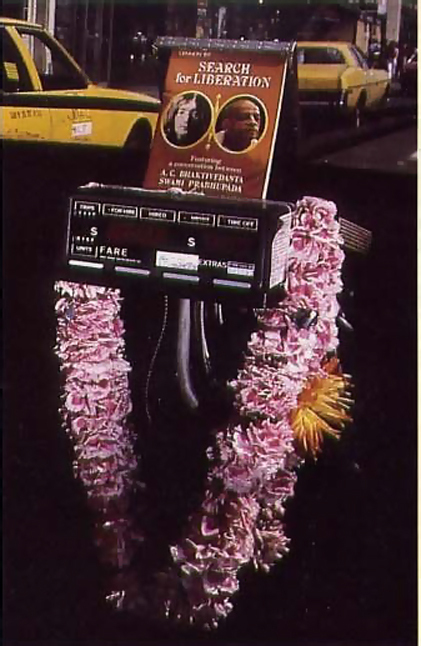 As Molly struggled out of the taxi I knew that her life had been changed, by contact with Srila Prabhupada’s books, the holy name of the Lord, and some conversation with a devotee. She was appreciating that association, and I felt fortunate to have been able to give her some real information that could help her find some relief. The Metro Cab Company now has about five drivers reading Bhagavad-gita As It Is, and at least two drivers distribute them. In the Bhagavad-gita Lord Krsna says, “Never was there a time when you did not exist, nor in the future shall you ever cease to be.” But the body comes and goes quickly, so we must exist before its birth and after its death. This brings us the idea of reincarnation, or “transmigration of the soul.” And I’ve found that many people are ready to accept it—especially when I drive them to funerals. Puru: When you get there the people will be saying, “He’s gone,” even though his body is right there in the coffin. So who went? Who was he? He wasn’t that body but something else. He’s an eternal spirit soul, part and parcel of God, and now he has moved on. Passenger 1: I suppose you’re right. Puru: You know, the most amazing thing is that everyone’s body will die but no one admits that to himself. Everyone wants to think he’ll live forever, even though they know that the body will die. Passenger 2: Well, no one likes to think about it. Puru: But that won’t stop the influence of time. Passenger 1: I guess not. Anyway, thanks for you words. They’ve given us a lot to think about. Puru: Thank you very much. Hare Krsna. Passenger 2: Have a nice day. Eating out is a major pastime of native New Yorkers and tourists. One time I picked up a family from Columbus, Ohio. Wife: Can you recommend a good restaurant? We want to have lunch. Puru: Well, ma’am, I’m very sorry, but I’m a vegetarian. I don’t eat meat, fish, or eggs, so it’s hard for me to recommend any place. Wife; That’s interesting. You’re probably very healthy. You see, George, he’ll never get stomach cancer. Listen, convince my husband to become a vegetarian. He has an intestinal disease. Husband: Yeah, I’ve got some kind of colitis. I have to have a really bland diet. Puru: Well, meat-eating is certainly harmful physically. But beyond that the spiritual detriment is even more severe. Wife: What religion are you? Muslim? Puru: No, I belong to the Hare Krsna movement. Husband: Oh, yeah, they don’t eat meat. Puru: We offer all our food to Krsna before we eat it, so we’re not even pushing just vegetarianism. Listen, here’s one of our books. Husband: Well, gee. Thanks a lot. People in New York often have to travel to the many hospitals and clinics in the city. Such trips are usually not happy ones, but one such trip had a unique outcome. Estelle flagged down my cab on 70th Street and York Avenue. Estelle: Please take me to the Columbia Presbyterian Hospital—the side entrance for the eye clinic. Puru: All right. Straightaway. Some kind of eye trouble? Estelle: Oh yes, I’ve had glaucoma for years. But they have a good doctor, and he’s been treating it very nicely. Puru: That’s good karma and bad karma in the same breath. Estelle: What do you mean? Puru: It’s bad karma to have glaucoma and good karma to have a doctor who can treat you. Estelle: Yes, I think you’re right: You know, I’ve been looking for someone to teach me how to meditate. Puru: You got in the right cab, lady. Let me introduce you to an important book. Have you ever heard of the Bhagavad-gita? Estelle: I read a small paperback copy a long time ago. It’s a poem spoken by Krsna, isn’t it? Puru: Yes. And much more. My spiritual master. His Divine Grace A.C. Bhaktivedanta Swami Prabhupada, has written the most authorized translation, Bhagavad-gita As It Is. That paperback you mentioned doesn’t compare. It’s very important to get a bona fide translation of the original Sanskrit. Estelle: Yes, I’ve heard of the Sanskrit language before. Puru: The Gita explains all about meditation, the yoga systems, karma, the living entities, the Supreme Being, and how they all relate. Puru: I don’t have any with me right now, but if you give me a one-dollar donation and your address I’ll get one to you. Estelle: Oh, that’s fine. Here’s the dollar. You know, I need something like this. I’ve had a very bad time lately. My daughter died last year at 43. I know if I learn to meditate I could cope with her death more easily. Puru: I think the Gita is just what you need. In the Second Chapter, Krsna explains to His friend and devotee Arjuna all about the eternality of the soul. A week or two later my wife and child and I visited Estelle at her apartment and personally delivered her copy of Bhagavad-gita As It Is. She received us warmly, and we spoke about the Gita for more than three hours. Estelle’s bookshelves now have several of Srila Prabhupada’s books. Estelle, Molly, and the tourist family are typical of the people you-meet in New York City. Their backgrounds vary from the poor to the rich, the uneducated to the Ph.D., and the common laborer to the professional. Occasionally celebrities get in my cab. I gave a BACK TO GODHEAD to Anthony Quinn, and I managed to preach a little to Rosemary Cloonie, Zubin Mehta, and Cicely Tyson. Richard, the doorman at the Mayflower Hotel on Central Park West, gave some books to Anne Miller for me. She’s currently starring in a musical on Broadway. Richard now has a Gita too. He offers respects with folded palms and bows his head slightly when he sees me drive up in my taxi. Sometimes I give prasadam (food offered to Krsna) to the boys at the gas pumps at the garage. Cookie prasadam is the next thing on my list for Richard. “Wherever you go, whoever you meet, tell people about Me,” Krsna told us five hundred years ago in His form as Lord Caitanya. And that’s what I do while driving my cab in the busiest city in the world.